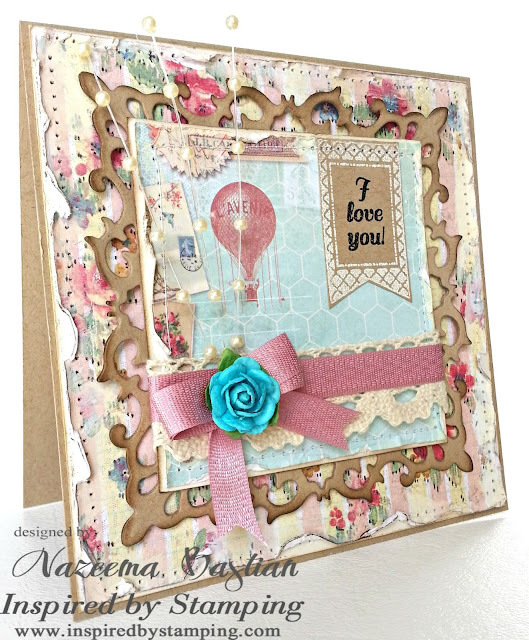 Did you get a chance to see Day 1 of Inspired by Stamping April Release Blog Hop? If you didn't check it out HERE. Now it's Day 2 and I am swooning over this new stamp collection. The possibilities are really endless, with this new collection. I had so many ideas for these tags, but just kept working the card til I was happy with the results. Believe me, I am. I LOVE the distressed shabby chic look of this card. I edged all my paper with white paint and them walnut stain. Then I curled and ripped, to give it more distressing. I used some beautiful Scalloped Border Crochet Trim and Colonial Rose Seam Binding, which coordinated beautifully with the paper. Did you see the tag, the upper right hand corner. Stamped on kraft cardstock and embossed with cream/white embossing powder. It really added and completed this card. Wait til you see the rest of the tags and sentiments that come in this set. You will surely love it as much as I do. Oh what a great card! I love that vintage, shabby look!!! Your card is gorgeous! I love the pretty pink. Love every detail of this card. A beautiful card all around! Thanks for joining us in the Timeless Tuesday Challenge! Wowzers! STUNNING! Love it Calypso! WOW, this is awesome card, Nazeema. I love all the layers and colours. Gorgeous shabby chic card, lovin the layers & distressing! Lovely Lovely Lovely! Love all the ink work! Love the paper, ribbon and everything about this card and you sure did make that little Creative Tag stick out. Just beautiful.